Encompassing all the recommended nylon-stringed models on GuitarFella, we refreshed our main classical chart – removing a few dated models (including the Lucero LFN200SCE and the Kremona S65C) and replacing them with three excellent electro-acoustic performers – the Kremona Verea, the Cordoba C5-CET Thinline, and the Yamaha CGX122MSC, as well as an affordable nylon-stringed beauty in the Stagg C546TCE. Is a Classical Guitar Right for Me? What is a Good Classical Guitar? How Much Does a Good Classical Guitar Cost? Which Brand of Classical Guitar is The Best? Looking for a nylon-stringed guitar? You’ve come to the right place! Because whether you’re a professional concert guitarist, an enthusiastic student, a steel-string guitarist who fancies a change, or a complete beginner to the world of guitar, this article aims to help you find your ideal nylon-stringed model. Premium playability, tone and craftsmanship from this high-end Kremona. An excellent classical crossover, with advanced electronics. An affordable, traditional classical guitar that doesn’t skimp on quality. A classical guitar designed specifically for beginners – great move Epiphone! An affordable student-friendly guitar from a trusted brand. A popular budget guitar, and it’s easy to see why! Ibanez produce a basic but solid entry-level classical with the GA3. Although you’re paying a premium price, the Kremona Solea is undoubtedly the best guitar in this chart, aimed at experienced players and professionals. With high-end materials and perfectionist craftsmanship, the sound is exquisite – full of depth and vibrancy across the registers. It feels pretty great to play too. Handcrafted in Bulgaria, an eye-catching solid cocobolo is used for the back and sides of the body, while solid red cedar is used for the top. The neck is made from Honduran cedar, with a classical 2.04” nut width, an Indian ebony fretboard and 19 frets. The hardware is great quality, and the guitar comes shipped in a deluxe wooden hardshell case. You can check out all the details in our full review of the Kremona Solea. Part of Yamaha’s NX series, this high-end NTX1200R electro-acoustic classical is a joy to play and aimed at stage performers. Steel-string and electric guitar players will be familiar with the reduced 1.89” nut width of the African rosewood neck, which is fully accessible thanks to the treble-side cutaway. The guitar is made entirely of solid wood, with a spruce top and rosewood back and sides. Acoustically it sounds vibrant and played-in (thanks to Yamaha’s A.R.E wood treatment), but it’s best when amplified. Highlighted in the full review of Yamaha’s NTX1200R, it is loaded with an advanced System 61 preamp and two-way pickup system. Versatile, playable, and it looks and sounds great – what’s not to love? The C5-CET is currently one of our favorite Cordobas, as it offers a high-end feel at a price that’s still very affordable for most. It’s also a stage-worthy nylon-stringed model, as the Fishman Isys+ system delivers great reproduction of the instrument’s naturally warm tone. This warmth comes from the mix of woods used in the construction – namely solid Canadian cedar on the top, while laminated mahogany makes up the back and sides. It looks great in both its natural and glossy black finishes, bordered with rosewood binding. Playability and comfort is also great for beginners and experienced players alike, especially the super slim 2.6” deep body. For our full C5-CET review, just click here! Yamaha’s electro-acoustic CGX122MSC is very traditional in look and feel, with a few tweaks that the modern guitarist will appreciate. Sticking with the classic, you find an excellent solid Engelmann spruce top (a cedar version also exists), paired with a laminated nato back and sides. The nato neck is sleek, but retains the traditional wide nut width and generous string spacing across the rosewood fretboard. But, as we mention in the full Yamaha CGX122MSC review, the action is low, and there’s a sizable cutaway for optimal fret access. It also comes loaded with Yamaha’s superb System 61 preamp and A.R.T. two-way pickup system for great tone reproduction, arriving with a versatile onboard control panel. From the Spanish brand’s popular Iberia series, the Cordoba C3M is an affordable model that doesn’t cut corners. Whether complete beginner or a more experienced guitarist, it’s a model that will appeal to most, with a sleek satin-finished feel and elegant appointments. The body is made using solid cedar on the top, with back and sides crafted from mahogany to give a warm and mellow sound. Volume is no problem either, with the solid, Spanish fan-braced top resonating well. As we mention in the full review of the C3M, the hardware complements the style and sound, including a bone saddle and nickel-plated tuners. For any style of nylon-stringed music, this is a solid choice from a brand you can trust. The ultimate classical guitar for beginners? Quite possible, as Epiphone have put a lot of thought into this entry-level nylon-stringed model. Professional players gave lots of input when the guitar was designed, resulting in an instrument that beginners will really appreciate. Features on this full-size guitar include a slightly shorter scale length and slimmer nut width leading to less stretching, while the rosewood fretboard has a special coating to give a smoother playing experience. Corners aren’t cut in the build either, with a solid cedar top and laminate mahogany back and sides. It’s hugely playable, and sounds pretty good too with plenty of projection. Don’t forget to find all the details you need in the complete review of the PRO-1 Classic . You don’t have to spend $1,000 to buy a real Cordoba – not when the wallet-friendly Protege C1 is available! This impressive entry-level classical guitar shows off a full-size, 25.6” scale length body with a traditional design (smaller versions of the same guitar are also available). The top is made from laminated spruce, with laminated mahogany back and sides. It sports a comfortable mahogany neck, with a rosewood fretboard, while the sound on offer for such an affordable guitar is fantastic – well-balanced and crisp. It’s no pro-model, but for beginners wanting something reliable to learn and practice on, you won’t go far wrong. You can read our full review of the Cordoba Protege C1 for everything you need to know. Good looking? Check. Great playability? Check. Affordable? Check. Stagg’s C546TCE is recommended for both beginners and intermediate players, as the budget brand have put together a quality classical guitar that doesn’t break the bank. Available in natural, glossy black, and a cool ‘blueburst’ finish, the C546TCE features a comfortably lightweight single-cutaway body, which has a slim profile – just 3” deep. As for woods, there’s a quality laminated spruce top, catalpa back, sides and neck, and a rosewood fretboard with 18 frets. It also comes complete with a decent EQ7545R preamp with built-in volume and 3-band EQ controls. For under $200, it’s a great buy. Be sure to check out the full review of the Stagg C546TCE. With the C40, Yamaha have produced a basic, but very good entry-level model that will suit complete beginners as much as it would an experienced guitarist looking for a cheap backup. As we highlight in the full roundup of the C40 , the construction is typical of your standard classical guitar, with a traditional non-cutaway style, a spruce top, meranti back and sides, and a nato neck with a full-size 2.06” nut width. Hardware and craftsmanship is nothing compared to some of the others in our chart, but Yamaha produce a pretty solid feeling instrument with a full and clear sound that’s excellent for lessons and practice. No bells or whistles here, but for under $150 it proves good value. While the Ibanez name is more associated with rock and metal music, their budget classical guitar – the GA3 – isn’t bad at all! It’s certainly no frills, but it gets the basics right and is therefore excellent for beginners, intermediates, and anyone who needs a cheap nylon-stringed guitar. The body sports the traditional classical design, with a full-size 25.6” scale length body made from laminated spruce on the top, with catalpa used on the back and sides. The neck is mahogany, with a 2” nut width and rosewood fretboard, while the bridge (featuring an Ivorex II saddle) is also rosewood. Ibanez couldn’t forgo the chance to add a little flair, and the red headstock is eye-catching! Check out the complete Ibanez GA3 review here. There we have a list of ten of the finest nylon string options – in their individual categories. You may question why we rate two greatly varying in price (such as the Kremona Solea and the Cordoba C3M) both at 4.8/5. Does that mean they’re the same quality? Not at all! Naturally, in a one vs. one scenario, the Kremona would win hands down due to its high-end construction, materials, sound and overall feel. However, both of them earn a 4.8 in their respective categories, which are relative to their price tag. With that in mind, let’s check out what else we should look out for in a guitar. That’s a bit of trick title… because the right guitar for you, is the right guitar for you! By this we mean that your level of playing, your style, your ambitions and your budgets will ultimately define what the best model is for you. What works for me, might not work for you. Which is why the models in our chart above range from cheap nylon-stringed guitars right up to high-end models. It will help to give a rough snapshot of how the market looks today, regardless of the price range you are shopping in. Perhaps the most important question to answer! And one you may be asking as a complete beginner, or an experienced guitarist looking to add the smooth sound of nylon to your collection. Without wishing to state the obvious, such guitar uses nylon strings instead of steel, and therefore sounds much more warm and mellow, lending itself well to jazz, folk and fingerstyle music, while nylon is essential for traditional classical music pieces and flamenco. If you are a beginner, then a classical starter guitar can benefit you in the early stages. These guitars are usually slightly cheaper than their steel-string counterparts (so you tend to get a better-quality instrument for the same price), while the strings tend to be less painful for beginner fingers. However, there is much debate as to whether a classical is the optimal choice if you eventually want to go on to play a steel-stringed so, ultimately, it’s worth reading more on the pros and cons, then make the decision that suits your ambitions. It depends on what you are using it for. If you are using the guitar for performances of any sort (more than just a gathering of friends in a small room), then you’ll certainly need to amplify your sound. That usually means either buying one with electronics already installed, or placing a condenser microphone in front of the guitar as you perform. Miking up the guitar is great way to capture it’s natural tone, and professional guitarists – whether performing or recording – will probably opt for this method. But for sheer convenience, plug-and-play electronics from brands such as Fishman, B-Band and Shadow can be hugely effective and versatile, allowing you to shape your sound directly from the preamp. If you are a beginner, it’s probably wise to ignore the last two paragraphs – you do not need electronics. Learn the instrument first before amplifying it. Chances are it will be a few years before you feel comfortable enough to perform to an audience anyway, by which stage you may consider upgrading your guitar. We’ve said it several times before, but occasionally – from a photo or a distance – a high-end $1,000 classical can look surprisingly similar to an entry-level $100 model or a mid-range $300 one. This is because there tends to be little difference in the fundamental design of these traditional instruments. However, when you get up close, you really start to see the differences. The first thing you may notice on a budget model is that the woods are nearly always all laminate – top, back and sides. Although there’s little aesthetic difference, laminate is the cheaper option. The pitfalls are that it’s less resonant and less tonally pleasing (even though tone is subjective). A solid wood guitar, whether made entirely of solid wood or just with a solid top, can be a lot more toneful and resonate more freely, offering a louder, more complex sound that will develop nicely as the wood ages. A guitar costing $1,000 will definitely show better craftsmanship than a budget model, and chances are it will have been made in a workshop by a skilled luthier instead of on a factory line. In fact, a $1,000 should be flawless in its feel and playability, showing no blemishes or rough spots. In contrast, the craftsmanship on a $100 unit is likely to be less impressive – maybe not particularly bad, but usually with plenty of room for improvement. Some entry-level guitars are also in desperate need of a good set-up when they first arrive, compared to the smooth playability of a premium guitar right out of the box. As design we’ve mentioned, designs can be shared among models of all prices. For example, the Cordoba C1 ($150) looks a lot like the Cordoba C10 ($1,050). However, as you move into the higher-end market, you can find some elegant, innovative and adventurous designs you just wouldn’t see in the budget market – whether it’s ESP LTD’s uber-modern TL-6N or a model from Godin’s premium Multiac Series. In the section above we determined that an entry-level/beginner’s guitar need not have electronics, but a classical guitar which is likely to be performed with should have the capabilities. Not every $1,000 model will have electronics, but those that do will tend to be advanced – some with dual pickups, and most with sound-shaping capabilities that go beyond simply adjusting the volume! A 3-band EQ (bass, middle and treble) is standard, while you may find a phase switch and even USB connectivity, for true plug-and-play convenience. The sound of any guitar is subjective, and what sounds beautiful to me may not be your cup of tea. However, it’s generally agreed that an expensive, lovingly-crafted guitar using quality solid woods will have more character than an all-laminate budget model. But for beginners, as long as the guitar is clear with enough projection (and the models we feature on our budget classical charts certainly are), then you’ll be more than equipped! Finally, it goes without saying that the hardware on a premium model should be good quality, helping both the sound and functionality of the model. On a budget classical guitar, you expect the components to work, but you could forgive a little tuning stability or stiff tuning keys. Not on a $1,000 model – tuning should be impeccable, and the nut and saddle should be bone (or a modern bone alternative, such as GraphTech’s Tusq). More often than not, when you pay a grand for a guitar, a good-quality protective case should come with it as standard. You can sometimes expect a gigbag or other free accessories with an entry-level option (replacement strings, polishing cloth, humidifier), but these are all easily purchased separately and shouldn’t be a deal-breaker. Defining a ‘good’ classical guitar isn’t an easy task. 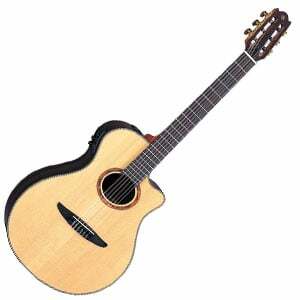 Of course, something like a Cordoba C10 CD at around $1,200 is a great guitar. However, you don’t need to spend that much to find a good model, as good models share a few similarities whatever the price. Unlike a steel-string acoustic or electric guitar, the action of a classical guitar isn’t particularly important. In fact, you could compare both a $50 classical and a $500 classical to find that the action is identical. Instead it is the craftsmanship and tone of the classical guitar that will ultimately determine if it is a good guitar. For example, whatever price range you are shopping in, a good classical guitar will have a neck that feels smooth and easy to play, with no sticking points (regardless of whether it is gloss or satin-finished). You should also look for a guitar that shows good workmanship, with no rough patches or excess glue showing. Of course, the higher the price band, the easier it is to find what we would class as a good guitar as more time is spent on the craftsmanship, while the use of better materials ensure the tone is always rich, warm and sweet. 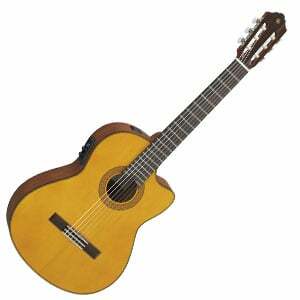 Following on from our previous answer, you can find a ‘good’ classical guitar in all price ranges. In fact, with $100 in your pocket, you can end up with a very good nylon-stringed guitar for practice, with a smooth neck, decent tone and no obvious flaws. However, most guitarists would class a ‘good classical guitar’ as one that sits a few rungs above the entry-level price range. Not quite a high-end premium model, but perhaps a guitar that is suitable for small performances as much as it is your go-to guitar when relaxing at home. This style of guitar would feature some sort of solid wood (usually on the top of the guitar), with a sleek neck, upgraded tuners, great overall craftsmanship and a beautiful tone. For one of these guitars, you would need to look in the $300 to $500 ranges. There are so many brands of classical guitar that trying to announce ‘the best’ is a very tricky ask. However, some names always pop up and end up at the top of comparison charts. Two of these are Kremona and Cordoba. Established in Bulgaria in 1924, Kremona has a great reputation for both affordable and high-end classical guitars. Cordoba are a newer brand (established in 1997), but it has an equally impressive reputation thanks to the high-quality guitars in its catalog. However, it’s not just those two. Yamaha is another brand with a great standing in the world of nylon-stringed instruments, and its models are highly respected in the entry-level markets as much as they are the premium. Whatever your budget, whatever your style, and whatever your aspirations, you’ve all come to this page for the same reason – you are interested in buying a new classical guitar. We hope our chart and the individual categories you can explore further have been helpful and have given you some inspiration. Make sure you read plenty of reviews and watch review videos of your shortlisted models – possibly even try them out if you can – before making the purchase. Because regardless of whether you’re spending $80, $500 or $2,000, nobody should waste their money on something that’s not suitable for them. Which nylon string guitars are best to play with other steel string electric guitars?